The proposal -- jointly unveiled by Sens. Lindsey Graham (R-S.C.), Bill Cassidy (R-La. 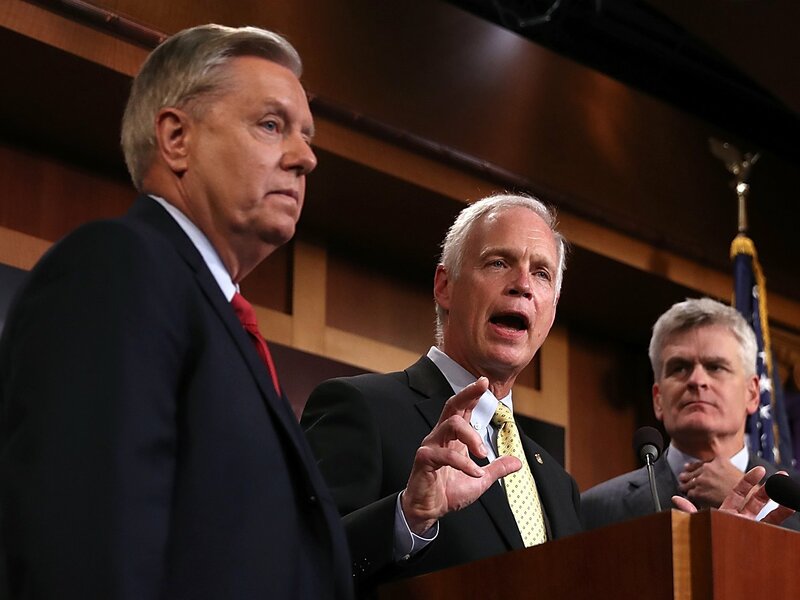 ), Dean Heller (R-Nevada), and Ron Johnson (R-Wis.) -- would eliminate ObamaCare's premium tax credits at the beginning of 2020 and block grant funding to the states to help provide health insurance to those who need assistance to purchase coverage. It would also block grant Medicaid funding on a per capita basis to the states. States that haven't expanded Medicaid would not be able to do so and expansion of the program would end at the beginning of 2020, at least in name only, as expansion level funding would still be given to the states through block grants. In total, federal payments to states would total $1.176 trillion from 2020 through 2026. This figure doesn't include other grants and funds that would be provided by the proposal. Unfortunately, most of ObamaCare taxes would remain in place under Graham-Cassidy. Still, the proposal would zero out the individual and employer mandates retroactive to 2016 and repeal the medical device tax, the elimination of the Medicare Part D deduction, the tax on health savings accounts (HSAs), and the Medicaid provider taxes. A positive of Graham-Cassidy is that it would expand HSAs and, like the Better Care Reconciliation Act, would allow funds from an HSA to be used to purchase health insurance coverage. The expansion of HSAs was a centerpiece of the House-passed American Health Care Act and the Senate's Better Care Reconciliation Act. To this point, only the Better Care Reconciliation Act proposed using HSAs to pay insurance premiums. Graham-Cassidy attempts to address a disparity in funding by 2026. Under ObamaCare, three states -- California, Massachusetts, and New York -- receive 37 percent of all money distributed. The state-by-state breakdown is available here. As one can see, California will see its overall funding reduced by 8.32 percent. Kansas, a non-Medicaid expansion state, would see a 634.31 percent increase in funding. Oregon would see the steepest decrease, at 28.15 percent, while Mississippi, also a non-expansion state, would see the largest increase, at 923.88 percent. The proposal contains a version of the Consumer Freedom Option, which was pushed by Sen. Ted Cruz (R-Texas) and eventually included in the final version of the Better Care Reconciliation Act, albeit watered down. This means people would be able to purchase a catastrophic health, with premium assistance. Presumably, those who would choose this option, which bypasses ObamaCare's costly regulations that have driven up the cost of coverage, would be included in the same risk pool as those who are higher risk, diminishing the benefits of the Consumer Freedom Option. Another aspect of Graham-Cassidy is the repeal of ObamaCare's cost-sharing reduction payments to health insurance companies. These payments have never been explicitly appropriated by Congress, yet the Obama and Trump administrations have unconstitutionally made the payments. The catch is that the proposal does appropriate $25 billion over two years, 2019 and 2020, that would be used to address coverage disruptions. Block granted funds could also be used for cost-sharing. Unfortunately, the proposal doesn't include the expansion of Section 1332 waivers. Known as "State Innovation Waivers," the Better Care Reconciliation Act expanded this provision of ObamaCare to allow states to opt out of certain costly regulations not allowed under current law. The path forward on the proposal is complicated by hearings in the Senate Health, Education, Labor, and Pensions Committee, chaired by Sen. Lamar Alexander (R-Tenn.), which could lead to a bipartisan bailout of health insurance companies. Democrats would do everything they could procedurally to stall the process. Still, Leader Mitch McConnell (R-Ky.) has asked the Congressional Budget Office for a score of a Graham-Cassidy, showing that he's willing to bring the amendment to the floor if the votes are there. Sen. Cassidy claims to have the support of 48 or 49 Republican senators. Sen. John McCain (R-Ariz.), who infamously killed Republicans' hopes of advancing a so-called "skinny repeal" of ObamaCare to keep negotiations with the House alive, has said he's on board with Graham-Cassidy. But to get to 50 in the Senate, which would allow Vice President Mike Pence to break the tie, some tweaks, such as state flexibility on certain ObamaCare regulations, may need to be made.